I had taken a break from working on the new block for several days as I dealt with the recent Belmar show, preparations for the coming semester, a federal holiday. But there was nothing else I had to get done today, and it was as nice a day as one can expect in January, so I decided to go up to the Studio and get back to work. I was still unsatisfied with the figure I added to the upper left corner, so I erased her and replaced her with a new one, a combination of a woman from a Degas monotype and one from an ad in a local entertainment paper. I like the new figure, but it's way too large for where it fits in the image. Another time I'll work on shrinking it down. I moved on to some cutting. I decided to tackle the last large car, the one in the upper right corner. Unlike the first three, this one wouldn't be carved to white, but to an optical gray, which would separate from the car next to it. As I was doing that, I started cutting out the pedestrian in front of it. I had to take care of some other things today, so I ended the session there. Below is the state of the whole block as of now. During the hours I was there, Brendan stopped by with more information about the upcoming arts festival the building is hosting. Artists in the building are teaching him the procedures needed to host an art show as we go. So nothing to be reported right now. Information from us is due there by the beginning of February. Once I know what I'll be showing, I'll let you know here. Tonight was the opening reception for "You Are What You Eat", a salon exhibition at the Belmar Arts Council. We typically open the year with a salon show, an open member exhibition where the artists are invited to briefly speak about the work on display, take questions, etc. This year we were asked to provide food that reflects what was depicted in our artwork. 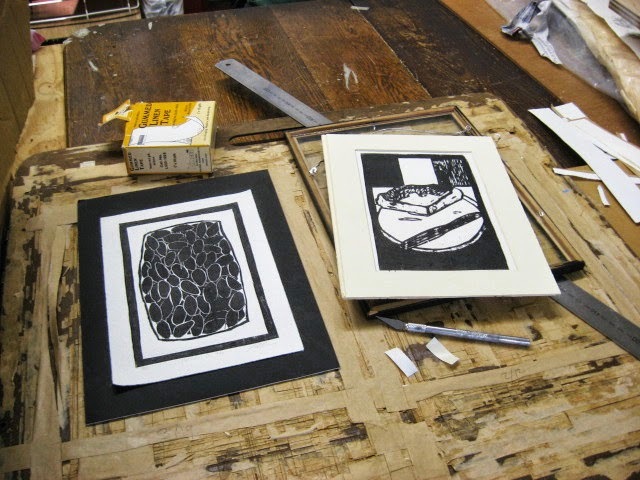 I had chosen two prints from the Fourth of July series, blocks that survived Hurricane Sandy and showed food that would be suitable for an art reception. 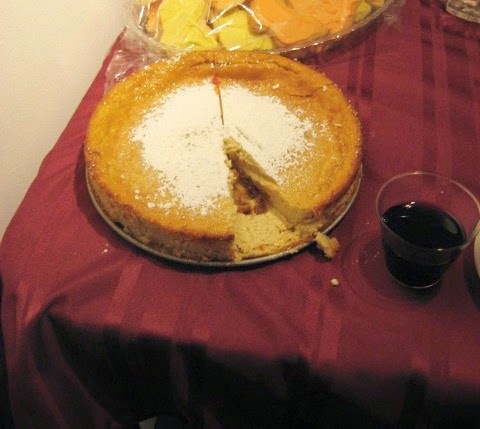 Of those two, I decided to go with the Italian style cheesecake for the reception. The baking can be done the day before, leaving very little to do the day of the event. It's been years since I made one of these, but the recipe and the procedure is pretty simple. Butter and flour a springform pan, mix the ricotta, eggs, sugar, and other ingredients in a big bowl, dump it into the pan, bake until it's done. I keep it in until it's a golden brown, then take it out and let it cool. 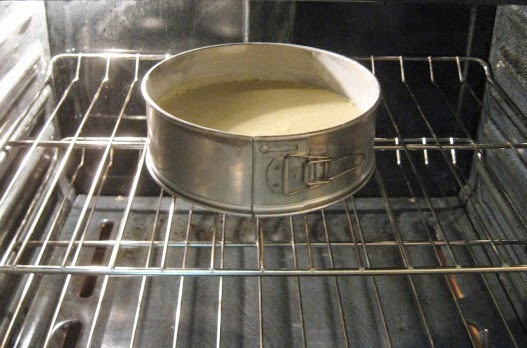 It rises in baking, then settles down again as it cools. Last night I covered it and stuck in my fridge. Late this afternoon I packed it (still in the pan), along with a box of confectioners sugar, and other utensils. 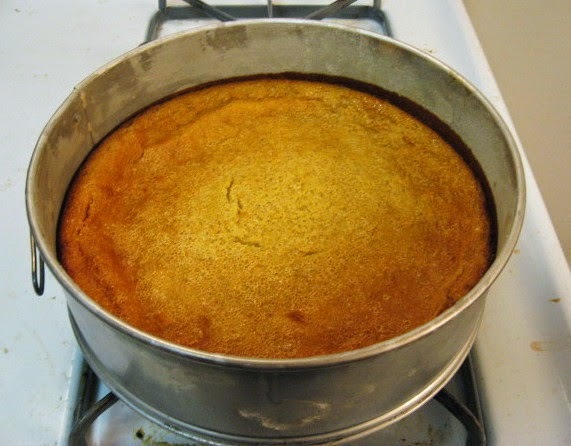 When I got to the Boatworks, I took off the round rim, dusted it with the powdered sugar, and put it on the food table. I was hoping to get a shot of the finished cake to match the two photos I had taken in progress yesterday, but in the seconds that it took for me to turn around and grab my camera, the cake was already attacked. Still, you get the idea. An attractive tasty dessert that looks like something that should be far more complicated than it is. I did get a chance to try a piece, and it was pretty much as I remembered it. Nothing left- I came home with an empty pan. The print will stay on display in Belmar through February 27th. More images from the reception can be seen over on the Belmar blog. Continued on the latest supermarket block for a few more hours this afternoon. Started the session by finishing the bed of the pick up truck, then I went on to the bodies of two other cars, and finished up by completing the cutting of the cart corral. Still a very long way to go, but the pattern of dark and light and the movement in the composition is a little more clear. Next up will be the rest of the cars, then the three figures. 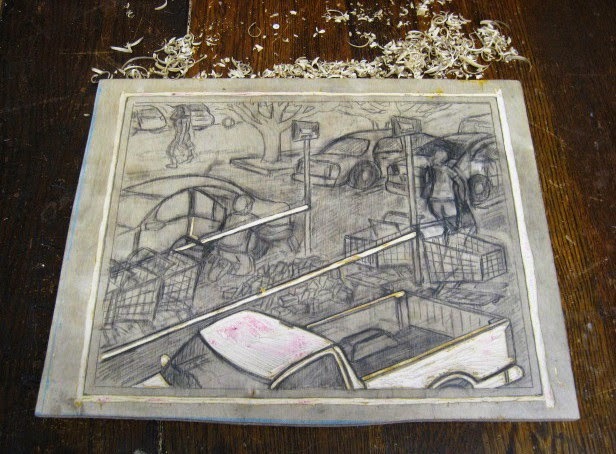 The block drawing is done enough that I can start the cutting process. A lot of this is about the balance of value, and in a dense design like this, I'm likely making adjustments as I go anyway. 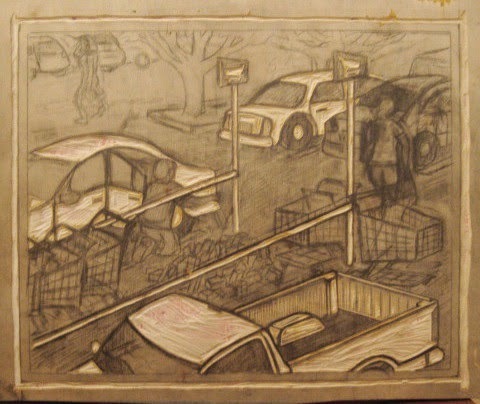 I started with my usual cut around the border, then worked on two things I expected to be white from early in the drawing- the pick up truck exterior, and the horizontal bars surrounding the shopping cart corral. Most of the scene is adjacent to at least one of these items, so I decided to start with them and let some of the decisions be reactions to what comes. I expect to be back at it tomorrow. Possible snow missed our area today, so during the day I went out to take care of errands and put in a shift at the Studio to try to resolve the latest block drawing. 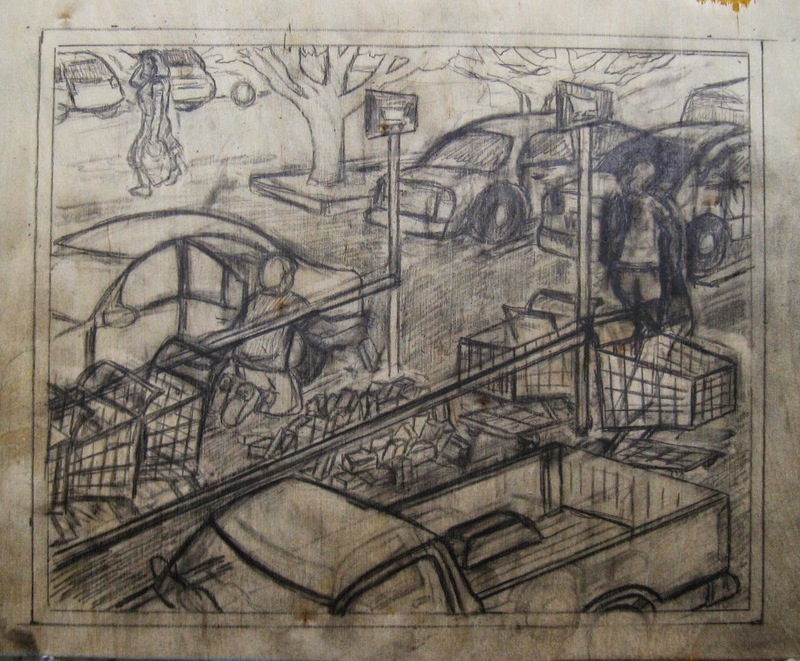 Things done today include redrawing the shopping carts to the left, an adjustment to one cart over to the right, and rouging in a figure in the upper left background. I still may need to make some improvements as I go, but I think enough is done that I can start cutting the block the next time I go in. I awoke this morning to see air filled with snow, and a coating of the stuff on everything outside. Temperatures were in the 20's, which normally sounds cold, but compared to the past few days, that meant things were actually warming up. By late morning the snow had ceased and the sky was brighter. Cleared off my car and my parking spot, then went back inside for lunch and let the sun do the rest. I'm not saying that it got warm today, but any place hit by sun was dry by the end of the day. If I had to, I could have stayed home and worked there, but on a beautiful day like this it made sense to get up to the Studio. Tomorrow is the intake day for artworks for the next Belmar show, so I needed to get them framed today. 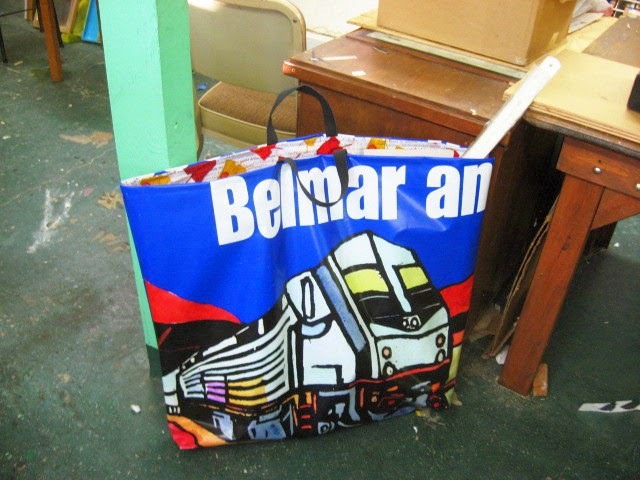 My large train banner tote bag once again served well to help me transport framing related stuff from home to a place where I could spread out and work. When I first printed up these two food prints, I had been thinking about coloring them, to give them a separate identity from the the original series. But looking at them for the past week, I couldn't make up my mind how I would color them, so I'm just going to go with the original look. For frames I had some old ones. A frame with a white window mat held a similar sized woodcut, so I just swapped my cheesecake image for that one. 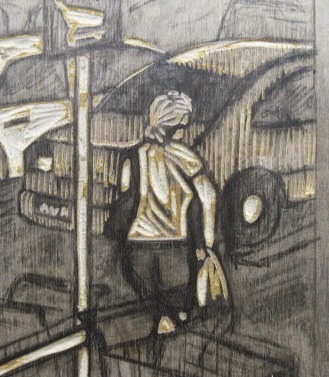 Another frame had a similar sized print attached to the surface of a piece of black matboard. Not archival, but for this show it wouldn't matter. However, a bigger frame would work better, and while cleaning the basement in Manasquan we found an inexpensive document frame the right size. Just had to cut a new rectangle of matboard and tape the olives print to it. While I was up there I had something else to deal with. For years, the building management has been talking about doing a whole building art show. It is the Jersey Shore Arts Center after all. The third floor is now operational, so I guess it's time. They left fliers under our door earlier this week with the basic schedule, but today I went upstairs and spoke to Brendan about it. There will be events the final two weekends of February- our art on the walls, plus things like live music, open mic nights, theater previews, refreshments, etc. I generally have a surplus of framed work in storage, so I can fill as many walls as they want. There is also talk of a open studio day, which would be fine if I can get Molly to clean up her stuff by then. I'll post details as we get a little closer. The other thing that's new this week is that we are trying out a new partner. Jackie is a painter/pastel artist who had a gallery space/studio in Asbury for years, as well as a store in Ocean Grove. 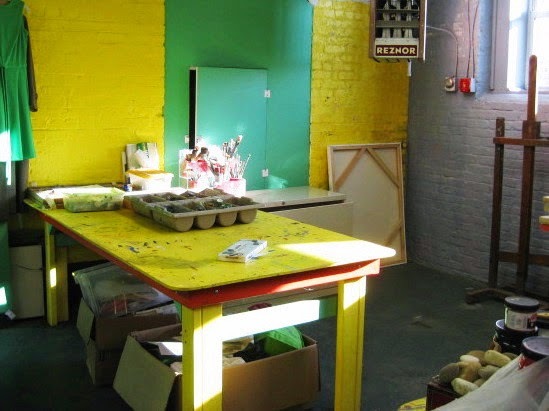 Molly has been selling silk screened items through her for years. Toward the end of last year she had expressed an interest in having a place to work for a few days a month, and we agreed on a proportional fee she would pay. Less than the share Molly and I pay, but then taking up less space than we do, and it will cut our costs. Molly gave her a key and one day I found the corner near the heater had been rearranged like this. Different from how we had it, but an efficient use of the space. Oddly, Molly seemed shocked when she saw it, saying they had never discussed moving anything around. Well, that was all Molly's stuff, so they can work it out between them. Took care of various business today, including photographing and submitting images for the next Belmar show, which were due today. As long as I was photographing and editing those, I shot the updated version of the supermarket block, as seen in the crit a few days ago. The most significant work was the brick pile, which is about the same overall size that it was, but the bricks are more defined and the subject is clearer. I redrew the brick guy's extended right arm, changing the angle and height, giving more room to show the brick he's dropping onto the pile. 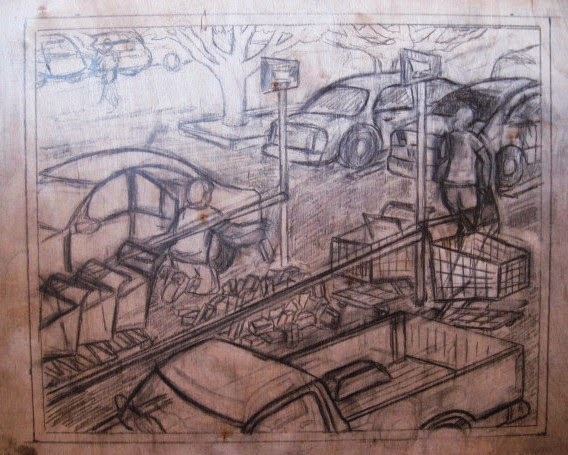 Roughed in a few things in the upper right corner, the beginnings of a second tree and a hint of another car behind the ones I had. Everything up there will need more work, but not too much detail. It's just to fill space and provide atmosphere, while the stuff in the foreground gets the attention. I do need to fix some things with the shopping carts, but this will be ready to start cutting soon. I got to the Studio this afternoon, planning to get in some work before everyone arrived, and I discovered that I had left my camera at home. 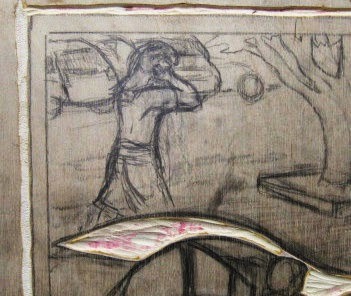 This wouldn't affect my ability to sketch anything, but I would have used it to show a few things, plus to document the work brought by everyone else. I wasn't sure who was even coming, since the only person I had heard from was someone currently out of the country. In the end we had six participants, all with something to show. 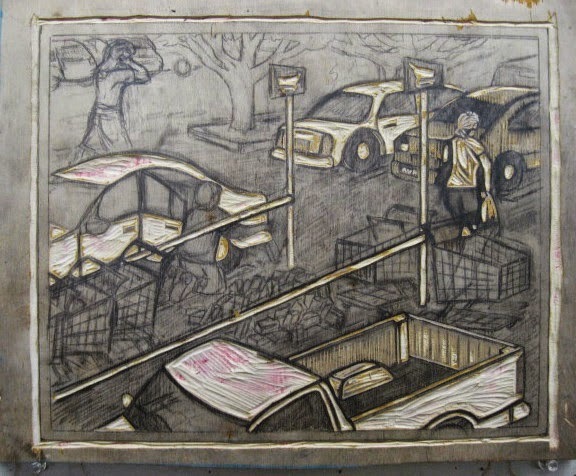 Molly had some drawings and other processes done with found objects, such as reworked surfaces of Cracker-Jack boxes. Catherine had some large monoprinted color woodcuts, experimental pieces that we saw as possibly finished. Mary G had a series of small graphite sketches, shapes that could be teardrops or plant parts. Marci had a bunch of sticker pieces, anonymous art designed to be quickly adhered to public spaces. Jane brought two large tree drawings on paper. Molly had been excited by the latest Christmas card, so I showed that along with the original artworks that inspired it. But mostly I talked about the supermarket block. Some knew the story already from previous crits, but some were hearing it for the first time, which let to some questioning as to why the guy was dumping old bricks in a supermarket parking lot. I'm not creating the story, just reporting it. No major suggestions for the drawing, just to go ahead and start cutting it. I think that will happen soon. December often means putting my regular art projects on hold while I get my annual Christmas card done, and handle the end of the semester/grading stuff. So it's been a little while since I last worked on my current block, the latest in the supermarket series. But tonight is critique night and it's time to get back to work. Most of the block drawing is finished, but one thing not fully resolved yet was the pile of bricks right in the center of the composition. I prefer to draw from life when I can, but since I don't own a giant pile of bricks, the next alternative is to seek a reference. Then one day I found a great one while watching cartoons. 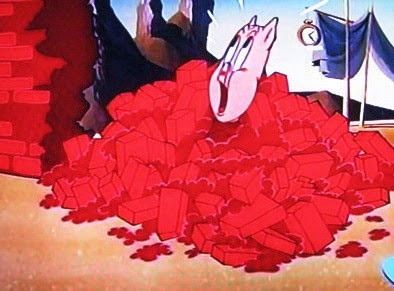 In 1938, Warner Brothers put out one of the all time classics of animation, a cartoon called "Porky in Wackyland." It was in black and white from director Bob Clampett, showing Porky Pig traveling deep into Africa in search of the last dodo bird, worth a fortune. (actually the dodo was native to only the island of Mauritius, hundreds of miles away from Africa, as I learned when I was partnered with an artist from that island for a big international collaborative project. That very limited environment is why extinction came so quickly) The cartoon was remade almost shot for shot in the 1940's in color under the title "Dough for the Do-Do". If you ever saw either one, you'd never forget it. The original is on the authoritative list of all time greatest cartoons and is in the National Film Registry, but most people are probably more familiar with the color version. Almost pure surrealism, Porky moves through a landscape that seems directly taken from Salvador Dali, inhabited by creatures that would fit into a Bosch painting if not played for laughs. In the above scene, the DoDo bird is running away from Porky and suddenly drags a large brick wall into the path of the pig, the collision bringing it down around himself. My childhood memories of the cartoon center on the crazy inhabitants, but when I saw it again a few months ago, I noted the brick wall scene. So when I saw it again on the Looney Tunes hour recently, I recorded it for future use. This afternoon I took a few screen photos like the one above, then used them to do some sketchbook drawings of a brick pile- no need to be exact to my source, but just to try to achieve the shapes and rhythms. The other major thing to still deal with was the upper right corner of the block, deep space beyond the cars in the parking lot. The leaves are now down from the trees, and seeing my apartment complex through the branches, I thought that might work. However, the level viewing angle used in the composition won't allow for anything that far away. My plan was to get up to the Studio a few hours early (parking can be a challenge on Monday nights) and update my sketches before everyone arrived.